In the baking world today, the buzzword is KitchenAid. Well, this is because of the fact that it offers several cutting-edge and high quality baking tools and equipment that can provide bakers from all over the world with a highly satisfying baking experience. 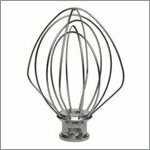 For years, it has been the tradition of KitchenAid to create and innovate the best KitchenAid Stand Mixer Attachments and KitchenAid Stand Mixer Accessories that will change the way of how baking is done. The most well-known models that have attachments and accessories above. For example, KitchenAid Professional 600, KitchenAid Artisan Mixer and KitchenAid Professional 5 Plus. If you are a self-confessed baker that is obsessed in creating different recipes and homemade treats for your family, then you shouldn’t have to miss the accessories and attachments that KitchenAid has in store for you. The following are some of the best attachments and accessories for KitchenAid Professional 600 / KitchenAid Artisan Mixer / KitchenAid Professional 5 Plus (and more) that will help you enjoy every moment of your life in the kitchen. They are durable, versatile and of high quality, so you will never regret having them in your kitchen. Wire Whip – this accessory ships in a guaranteed frustrations-free packaging. It is also versatile because it can be used with KitchenAid KSM90, K45, KN15, KSM75, KSM103, KSM110 and KSM15. It is also highly commended for providing maximum volume for mixtures that need air. In order for you to secure that you can use this conveniently, it is offered with 1-year warranty. It is also safe to use because only high quality materials were used for its construction. Apart from that, it will also provide you a high level of satisfaction when beating eggs and other ingredients. 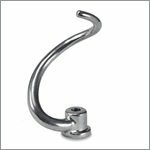 Spiral Dough Hook – the exceptional design of this KitchenAid dough hook imitates hand-kneading with a great force that can knead yeast bread effectively. This is also a versatile type of attachment that can be used with the following units: KB26G1X, KL26M8X, KP26M8X, KP26M1X, KV25H0X, KV25G8X and KV25G0X. With its dishwasher-safe feature, you can easily clean and store it after every use. No wonder, this is considered as one of the best spiral dough hooks there is in the market today. 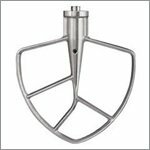 Flat Beater – this unit is shipped in guaranteed frustration-free packaging that is very ideal for mixing cookie dough, cake batter and many more. with this accessory, you will no longer have any problems with regard to mixing all your favorite desserts. Therefore, this is indeed a must-have in your kitchen if you have the passion for baking. Stainless Steel Bowl – this is one of the most commendable accessories from KitchenAid because of the fact that it is well-made. It features a durable exterior and a brushed interior, thus making it the perfect bowl for your baking needs. It comes with a flat base that keeps the bowl steady. It is also easy to clean because it is dishwasher-safe. With its 1-year warranty, you can have the chance to use it with utmost convenience. Your money will surely be worth it when you purchase this KitchenAid accessory. Water Jacket – this attachment is designed to keep the whipping cream cool or to keep the mashed potatoes warm. This comes with a great quality that is why most customers highly commend this KitchenAid product in most reviews in the online world today. You will not experience any hassle or dissatisfaction in using this attachment. Another great thing about this is that it comes with a very reasonable price. 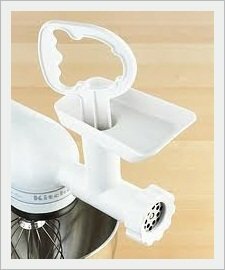 KitchenAid Stand Mixer Cover – this attachment is designed to protect the stand mixer. It comes with 100% cotton with piping, so you can have assurance that your kitchen unit is well-protected from any factors or elements that could damage it. Just like the other KitchenAid attachements and accessories, it also comes with 1-year warranty. Now that you already know some of the best KitchenAid Stand Mixer Attachments and KitchenAid Stand Mixer Accessories that will make your baking experience more fun and exciting, you should also discover the tips on buying them. Bear in mind that there is nothing better than knowing that you have in hand high quality, authentic and durable KitchenAid Stand Mixer Attachments and Accessories that have the best deals. Well, one of the best tips that you should follow is to purchase them only on legit and trustworthy local and online stores. By doing this, you will not just be able to get authentic KitchenAid products but to check out the fairest deals as well. Second, you should carefully examine the product you are buying. On the other hand, if you are trying to purchase online, you should read reviews to secure that it can provide you satisfaction or not. Now that you already know what the best KitchenAid Stand Mixer Attachments and KitchenAid Stand Mixer Accessories are, you will surely be always excited in baking your next homemade treat !.